Hereditary complete C4 deficiency has until now been reported in 30 cases only. A disturbed clearance of immune- complexes probably predisposes these individuals to systemic lupus erythematosus, other immune- complex diseases and recurrent microbial infections. We present here a 20- year- old female with hereditary complete C4 deficiency. Renal biopsy demonstrated renal AA amyloidosis. This unique case further substantiates that deficiency of classical pathway components predisposes to the development of recurrent microbial infections and that the patients may develop AA amyloidosis. Furthermore, in clinical practice, the nephrotic syndrome occurring in a patient with hereditary complete complement C4 deficiency should lead to the suspicion of renal AA amyloidosis. Hereditary complete deficiency of the fourth component of complement (C4) is an extremely rare disorder, with 30 cases reported so far. A disturbed clearance of immune- complexes probably predisposes these individuals to systemic lupus erythematosus (SLE),  a lupus- like disease, or glomerulonephritis, and other immune- complex diseases. Many patients have recurrent microbial infections and some die at a young age due to severe infections or organ failure. The fourth component of complement exists in two isoforms, C4A and C4B, which differ in their physicochemical properties. The genes for C4A and C4B are located on the short arm of chromosome six within the major histocompatibility complex (MHC) class III region. The human C4 locus is remarkably complex. The outcome is a sophisticated genetic diversity with multiple length variants with long or short C4 genes coding for polymorphic C4A and/or C4B proteins. ,,, Considering the relevant roles of C4A and C4B in immunoclearance as well as memory and effector functions of the humoral immune response, it is not unexpected that a deficiency of C4A or C4B is frequently associated with infectious and/or autoimmune diseases. Our patient is a female with complete C4- deficiency whose clinical course was followed for 20 years. She had a family history of hereditary complete deficiency of the fourth component of complement. HLA typing and genetic investigation was not performed. In the early stage of the disease, the C4 activity was markedly reduced and the activity of the classical pathway component was also decreased; however, the activity of the alternative pathway component was normal. From the age of two years on, the patient experienced multiple recurrent episodes of bronchopulmonary pneumococcal infection and bronchiectasis. At 20 years of age, she was found to be positive for urine protein and was referred to a nephrologist. The major physical findings were low body weight (body mass index: 16 kg/m 2 ), peripheral edema and orthostatic hypotension. Laboratory investigations at this stage revealed normal renal function (serum creatinine 40 μmol/L and creatinine clearance 115 mL/min) and proteinuria (4.5 g/day) without any hematuria. Serum protein electrophoresis showed hypoalbuminemia (28.5 g/L), the total serum protein was 66 g/L and there was increased polyclonal gammaglobulin level (13.9 g/L). The serum cholesterol was 5.5 μmol/L and triglycerides was 1.1 mmol/L. Liver function tests were normal. Hemogram revealed microcytic anemia of 10.2 g/dL. Serum immunoglobulin levels were normal. Serological evaluation included negative test results for hepatitis B and C and serum antinuclear antibodies. Low values of the complement system with CH50 of 13.5 U/mL, C3 of 1.23 g/L (0.90-1.80) and C4 of 0.09 g/L (0.10-0.40) were found. Ultrasound of the abdomen revealed normal- sized kidneys. With the suspicion that the patient might be having amyloidosis, a kidney biopsy was performed. Renal histology demonstrated renal amyloid A (AA) amyloidosis with characteristic green birefringence on examination under polarized light. Masson trichrome staining showed mesangial and vascular deposits of amyloid [Figure 1] and [Figure 2] while the tubulo- interstitium appeared normal. Immunofluorescence showed diffuse and intense staining along the capillary loops and in the mesangium with anti- AA serum, while staining with anti- lambda and antikappa serum were negative. 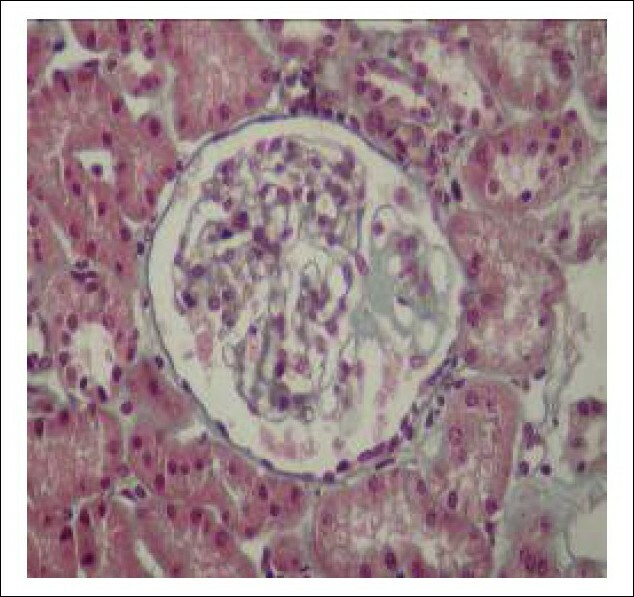 Figure 1: Renal histology showing mesangial deposits of amyloid (Masson trichrome staining). 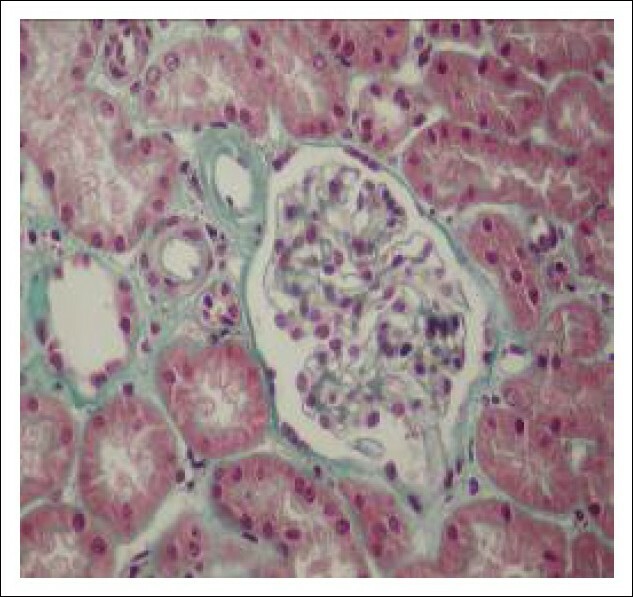 Figure 2: Renal histology showing vascular deposits of amyloid (Masson trichrome staining). Hereditary complete C4 deficiency has until now been reported in 30 cases only. A disturbed clearance of immune- complexes probably predisposes these individuals to SLE, other immune- complex diseases and recurrent microbial infections. Renal involvement in patients with hereditary complete C4 deficiency is described in some patients, and the most frequently encountered lesion was membranoproliferative glomerulonephritis, mesangial glomerulonephritis and membranous glomerulonephritis. ,,, The severity of renal disease is probably determined by activation of the alternative pathway of complement in the kidney. Amyloid A (AA) amyloidosis is the most common form of systemic amyloidosis worldwide. It is characterized by extracellular tissue deposition of fibrils that are composed of fragments of serum amyloid A (SAA) protein, a major acute- phase reactant protein, produced predominantly by hepatocytes. It occurs in the course of a chronic inflammatory disease of either infectious or non- infectious etiology, hereditary periodic fevers and with certain neoplasms such as Hodgkin's disease and renal cell carcinoma. In developing countries, the most common instigator is chronic infection; in industrialized societies, rheumatic diseases, such as rheumatoid arthritis, are the usual stimuli. In the United States, immunoglobulin related amyloid light chain type of amyloidosis (AL) is more frequent than AA as the cause of systemic amyloid deposition. This unique case supports the current view that deficiency of the classical pathway components predisposes to the development of recurrent microbial infections and that these patients may develop AA amyloidosis. Furthermore, in clinical practice, one must suspect the presence of renal AA amyloidosis in a patient with hereditary complete complement C4 deficiency who develops the nephrotic syndrome. 1. Hauptmann G, Tappeiner G, Schifferli J. Inherited deficiency of the fourth component of human complement. Immunodef Rev 1988;1: 3- 22. 2. Yu CY, Chung EK, Yang Y, et al. Dancing with complement C4 and the RP- C4- CYP21- TNX (RCCX) modules of the major histocompatibility complex. Prog Nucleic Acid Res Mol Biol 2003;75:217- 92. 3. Chung EK, Yang Y, Rennebohm RM, et al. Genetic sophistication of human complement C4A and C4B and RP- C4- CYP21- TNX (RCCX) modules in the major histocompatibility complex (MHC). Am J Hum Genet 2002;71:823- 37. 4. Yang Y, Chung EK, Zhou B, et al. Diversity in intrinsic strengths of the human complement system: serum C4 protein concentrations correlate with C4 gene size and polygenic variations, hemolytic activities and body mass index. J Immunol 2003;171:2734- 45. 5. Mauff G, Luther B, Schneider PM, et al. Reference typing report for complement component C4. Exp Clin Immunogenet 1998;15:249- 60. 6. Lhotta K, König P, Hintner H, Spielberger M, Dittrich P. Renal disease in a patient with hereditary complete deficiency of the fourth component of complement. Nephron 1990;56:206- 11. 7. Lhotta K, Thoenes W, Glatzl J, et al. complete deficiency of the fourth component of complement: effects on the kidney. Clin Nephrol 1993;39:117- 24. 8. Suzuki J, Suzuki S, Nozawa R, Kawasaki Y, Suzuki H. Membranoproliferative glomerulonephritis associated with hereditary deficiency of the 4th component of complement. Clin Nephrol 2003;60:279- 83. 9. Lhotta K, Würzner R, Rumpelt HJ, Eder P, Mayer G. Membranous nephropathy in a patient with hereditary complete complement C4 deficiency. Nephrol Dial Transplant 2004;19: 990- 3. 10. Jackson CG, Ochs HD, Wedgwood RJ. Immune response of a patient with deficiency of the fourth component of complement and systemic erythematosus. N Engl J Med 1979;20:1124- 9. 11. Uring- Lambert B, Mascart- Lemone F, Tongio MM, Goetz J, Hauptmann G. Molecular basis of complete C4 deficiency: a study of three patients. Hum Immunol 1989;24:125- 32. 12. Clark R, Klebanoff S. Role of the classical and alternative complement pathways in chemotaxis and opsonization: studies of human serum deficient in C4. J Immunol 1978;120:1102- 8. 13. Hauptmann G, Goetz J, Uring- Lambert B, Grosshans E. Component deficiencies. Prog Allergy 1986;39:232- 49. 14. Ellman L, Green I, Judge F, Frank MM. In vivo studies in C4- deficient guinea pigs. J Exp Med 1971;134:162- 75. 15. Bottger EC, Hoffmann T, Hadding U, Bitter- Suermann D. Guinea pigs with inherited deficiencies of complement components C2 or C4 have characteristics of immune complex disease. J Clin Invest 1986;78:689- 95. 16. Finco O, Li S, Cuccia M, Rosen FS, Carroll MC. Structural differences between the two human complement C4 isotypes affect the humoral immune response. J Exp Med 1992; 175:537- 43. 17. Akçay S, Akman B, Ozdemir H, Eyüboðlu FO, Karacan O, Ozdemir N. Bronchiectasis- related amyloidosis as a cause of chronic renal failure. Ren Fail 2002;24:815- 23. 18. Verine J, Mourad N, Desseaux K, et al. Clinical and histological characteristics of renal AA amyloidosis: a retrospective study of 68 cases with a special interest to amyloid- associated inflammatory response. Hum Pathol 2007;38:1798- 809.